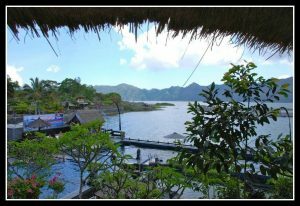 Bali – so what’s the big attraction? What lures tourists back to Bali? Its not just people I know who are frequenting this place. The Australian Bureau of Statistics* indicate Indonesia is the second most popular destination (behind New Zealand) for short term resident destinations. (1,012,800 Aussie visitors in 2013/14.) That’s a large number of Australians travelling to Indonesia. Unfortunately those stats can’t be broken down into exactly where in Indonesia – but I bet a large portion of those Australians are making a steady pilgrimage to Bali. 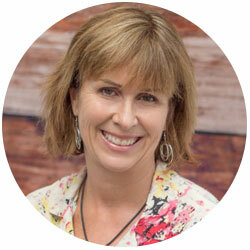 Wanting to know what exactly it is about the place that lures people back year after year, I approached regular visitor to Bali Tracy Dobbin, Salon Director of Coorparoo’s aesthetica. I questioned her about Bali’s allure. “Foreigners have discovered the magic of Bali,” she said. 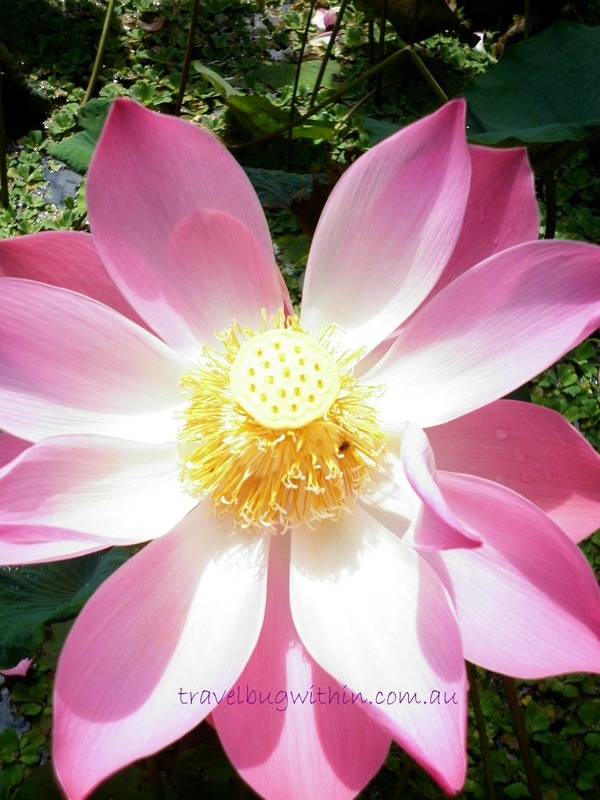 “Bali, is about a thousand simple experiences and endless natural beauty,” said Tracy. Watching her face light up as she reminisces, it’s apparent – Bali hooks people. 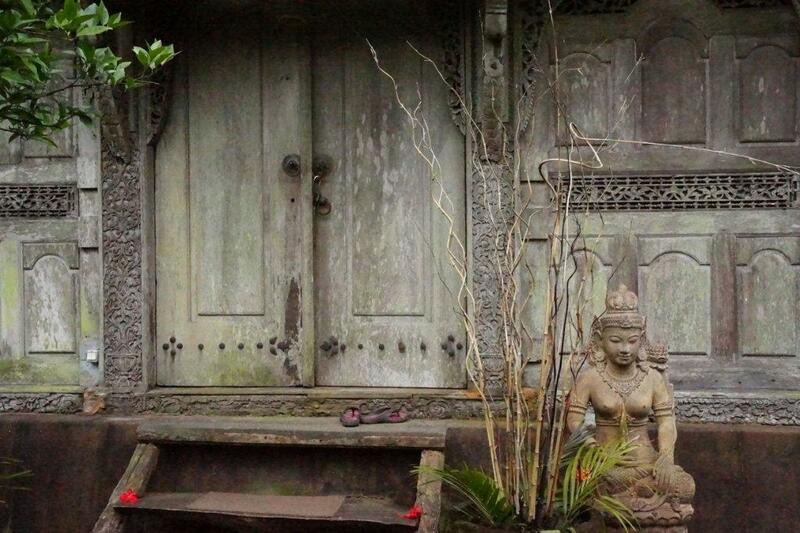 spiritual journey in the artist’s town of Ubud. With time and not necessarily an endless stash of money, tourists can immerse themselves in a Balinese experience of their choice. My wish was to immerse myself in the Balinese culture and village life. So for my first trip, I chose to steer clear of the Seminyak / Kuta Beach (party) area, instead selecting Bali’s epi-centre for culture – the Ubud Region. An area renowned for art, culture and also for healing and medicine (anyone who read Elizabeth Gilbert’s book, “Eat, Pray, Love” will know the Love section was based in and around Ubud.) Numerous spas and healing places offer massage and pamper treatments, at very reasonable prices. Ubud is also jam-packed with fabulous cafes and restaurants. 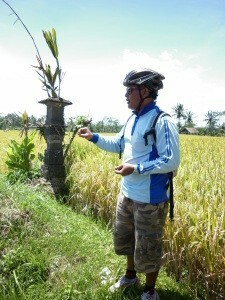 Bali’s weather rarely varies from tropical and hot, for much of the year. 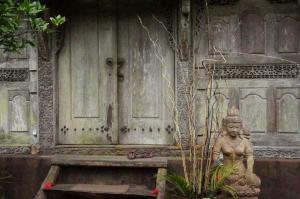 As Ubud, is situated higher in the mountains, it usually has slightly cooler temperatures (sounded appealing.) But it can rain at any time. The rain often lasts for an hour or two and usually cools things down. The only inconvenience, (as I discovered) is the rain may force you into one of the many bars or restaurants around town, where you just have to relax with a drink or two while waiting for the shower to pass. I spent a few days exploring the town of Ubud, indulging in many fine eating areas, spa treatments and shopping trips. Murni’s Houses was the perfect location for my first couple of nights in Bali as it was central to everything in Ubud town. 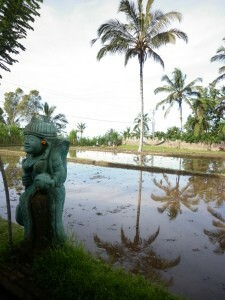 My next Balinese experience was in a small village called Singaparang, north east from Ubud. A 30 minute taxi ride higher in the hills, I headed to a place called Ayung Sari Indah (Sharing Bali), run by an Aussie Karen Willis and her Balinese partner Wayan. Ayung Sari Indah is a “simplistic” retreat where guests, family and friends stay in humble bungalows, each with their unique, traditional Balinese style. Every private bungalow has a balcony looking towards the mountains. Wayan has travelled all over Indonesia to small, remote villages searching for unique Bungalows. The houses, often in disrepair, are dismantled and shipped back to Ayung Sari, where Wayan, using his artisan skills, lovingly restores and re-builds them by hand. “It is Wayan’s special way of preserving Indonesia’s beautiful architectural history and culture,” said Karen. 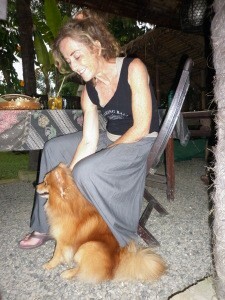 Karen for the last 15 years has travelled back and forth from Australia to build her dream place with Wayan. She is the consummate host, happy to share with her guests many intimate and insightful stories. Her knowledge and understanding of the Balinese culture and people, helps answer many of the niggling questions western guests and first–time visitors to Bali have. Karen would often join us at lunch and dinner, where in conversation she helped unravel the mystique beneath the magic that is Bali. 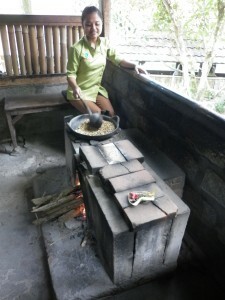 Breakfast, lunch and dinner are served in the communal eating area (Ayung Sari Indah is all about sharing.) A collection of musical instruments, near the dining area are available to the guests (musically inclined or not.) Attempts to bang the large ornamental gong or play the bamboo xylophone, seemingly summoned the staff who happily shared their musical talent. These gentle Balinese folk share their gift to create captivating music. Many evenings of fine dining at Sharing Bali were finished in this enjoyable manner. “How’s the serenity” comes to mind as I relax into the abundant piles of soft cushions in the bale (pronounced bar-lay) hut. Sipping on a delicious freshly prepared lemon grass teas, watching the storm clouds brewing – a memorable Balinese moment. For the adventurous, there are numerous activities to stimulate the energy levels. 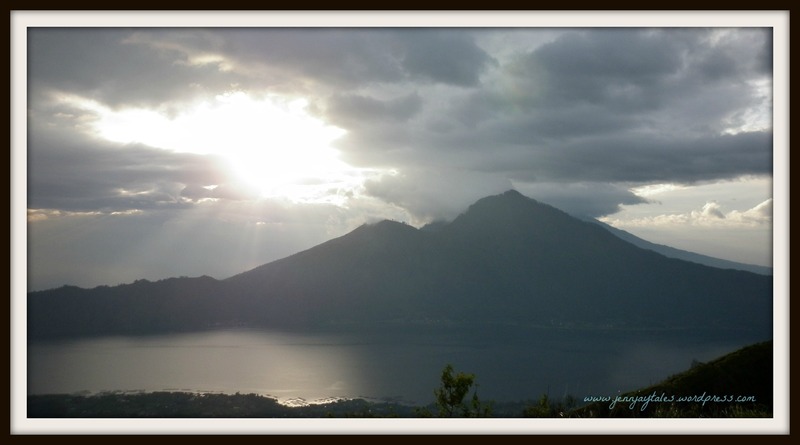 One highlight, was the Sunrise Volcano Climb. Mt Batur, the third largest active Volcano in Bali rises 1,717 metres above sea level. 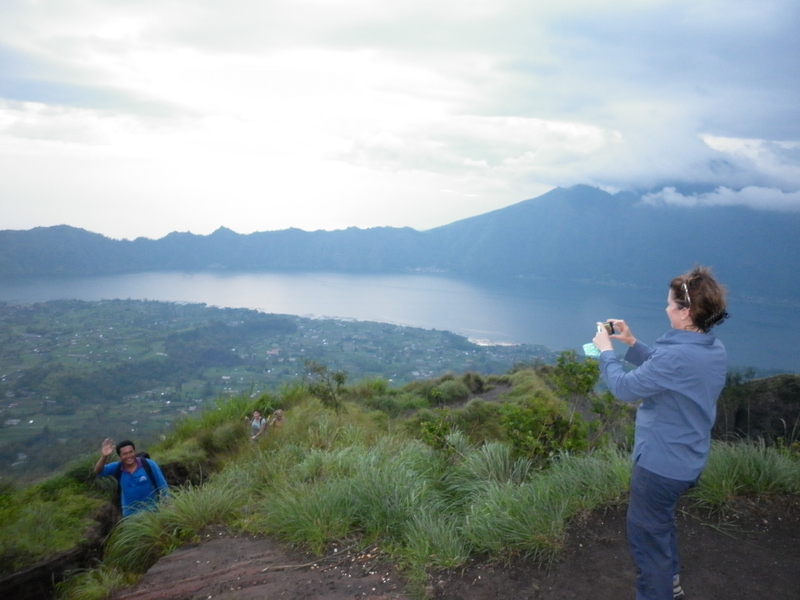 An early start (3am),from Ayung Sari and an hour’s drive brings us to the meeting place at the base of Mt Batur. It’s an eerie climb for the first hour in the dark, with only your personal torchlight illuminating each step. The terrain is steep and rocky at times, which is challenging. A better than average level of fitness, will ensure you arrive at the top with less huffing and puffing. But whatever your level of fitness, the friendly guides walk at your pace and your fellow walkers keep the spirits up. The early start and the effort is quickly forgotten when you reach the peak. “There is a massive overwhelming sense of achievement when you get to the top,” said fellow walker Sarah Thompson. While our sunrise may not have been spectacular with the morning’s heavy cloud cover, our party of walkers felt special. “We all shared this magical, mystical moment. We climbed this geographical monument and felt incredibly accomplished,” said Sarah. A taste of civilisation at the summit, is a lonely tent where you may purchase a coffee. 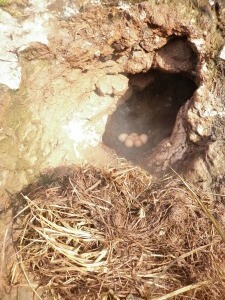 We sampled eggs, boiled by the guides on a naturally steaming volcano vent. How often can you eat a breakfast cooked by volcanic steam? Karen, (who joined us on our climb), kept our spirits up by telling us it would all be worth it, not just for the view and the sense of achievement, but for the soak in the hot springs after. She was right (again). The hot springs were perfect for our sore and aching joints. Another activity I chose, was to explore neighbouring villages by bike on an organised tour run by Eco and Educational Cycling Tours. Breakfast was at a hotel overlooking the majestic Mount Batur. The lava flows (where we climbed) were easy to see from this vantage point. The bike tour through villages involved cycling mostly downhill, minimising the need to change gears. We visited a coffee plantation and were entertained by the amusing guide’s animated voice and swift explanations. 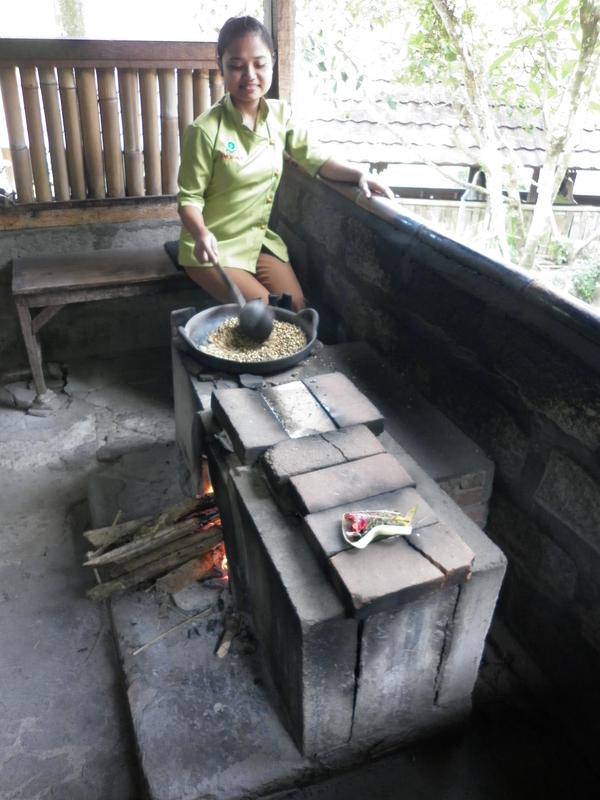 Karen and Wayan provide a truly authentic Balinese food experience. All meals at Ayung Sari Indah are made from fresh, locally grown ingredients cultivated in their own land or sourced at nearby farms and markets. 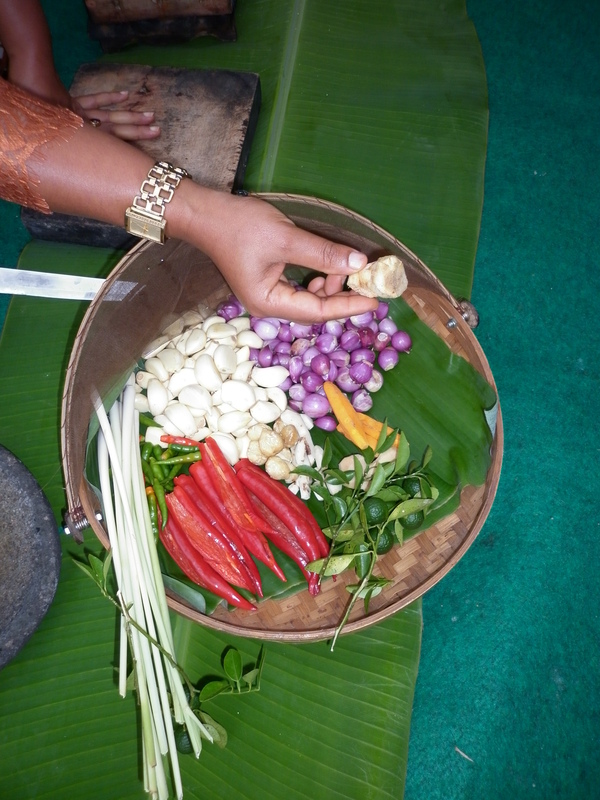 The food is prepared by hand using traditional methods. For Westerners used to supermarket shopping, it was enlightening to be reminded of the food cycle. Over the course of the week I’d seen many farmers toil in the rice paddies, using the same farming methods of many previous generations. When I open my packet of rice bought from the supermarket, I have a very different appreciation of its origin. Participating in an open air cooking class, provided a greater appreciation of how labour intensive and time consuming the food production is at Ayung Sari. 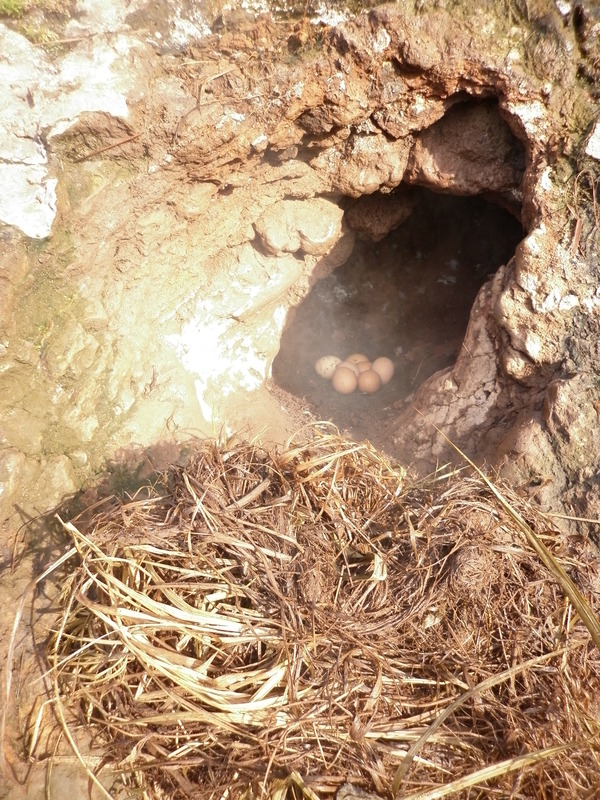 A labour of love and tradition, something Karen indicates the younger generation are no longer interested in. I’d seen a few fast-food “kitchens” on the back of small trucks and motor bikes in Ubud. 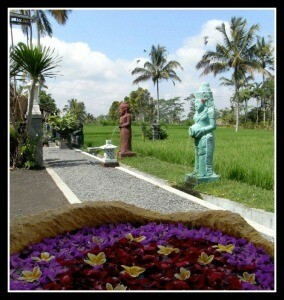 Bali it appears is also experiencing a generation preferring instant gratification over tradition. What made this Balinese retreat so special? Sharing Bali is all about personal treatment. Karen’s ease of sharing stories about her many years immersed in Balinese village life, further adds to the personable experience. 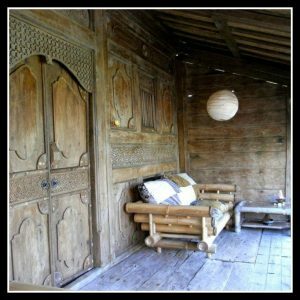 The unique bungalow accommodation are individual in character and abundantly charming. Larger more commercial resorts with rooms styled en-masse cannot compare. Wayan’s selection and placement of sculptures, water features, carvings and idols leave you with the feeling you’re in a tropical oasis. Add to this the feeling you’re part of a village community. Framed by rice paddies, watching swallows swoop and dive, it is impossible not to be caught up in the calm that is Ayung Sari Indah. As the days pass, you’re enveloped by the peacefulness, leaving you with no other choice than to slow down and leave the western world stresses far behind. Ayung Sari Indah is Sharing Bali as the gentle Balinese people sincerely intended. An experience you won’t forget and will most likely want to repeat. It also gave me an understanding of what is Bali’s allure and why travellers sign up for repeat experiences. Note the writer was not sponsored and paid for the entire trip and activities herself. you certainly have a “gift” in your writing … it was a pleasure to read all your stories and to hear your wonderful tales and how you too clearly “live in the moment” , I look forward to reading a lot more of your work .. bring it on ! Beautiful Jen, don’t forget the daily yoga and gentle Hindu influence that defines the culture….I’ll do a downward dog or two for you today!